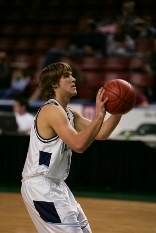 I have a few tips I’d like to share on basketball shooting drills. You might know them but there are a few subtle things I’ve seen go unnoticed when a player is training, and when corrected there was a significant improvement after a few practices. When it comes to free throws some coaches say, align your foot of your shooting hand with the basket. I like get my player to stand square to the basket. Bend the knees so they are at roughly a 35 degree angle. Make sure your player has their shooting arms elbow in to the side. As they raise the basketball it must go above the head so you can just see the basket. As they are doing this they must go onto the balls of their feet, then as they start straightening the legs, straighten that arm. But it must go out and fully extend at the same time as their legs straighten. Now, this may sound like the same but watch how some shoot free throws and they shoot flat footed; this spreads out the force of the legs reducing power, whereas on the balls of your feet it is a smaller area, smaller reduction, more force into the shot, meaning the shooting arm as it extends can be more relaxed and allow for a smoother shot. Players must be square to the basket. As the shoot arm extends the legs must straighten at the same time. At ALL time the player must be fixed on the back of the basket. All other aspects such as the guide hand should be on the side of the ball, loosing holding it to make sure it stays on the hand when it is raised but released slightly as the shot occurs. My players average 84 out of 100 free throws using this technique which is an average increase of 37% for the team and 11-15% percent increase per player.